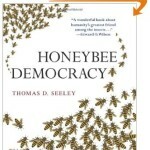 Shortly after they were introduced I purchased two of the poly National hives sold by Modern Beekeeping. These are well made but, in my view after using them for a few months, poorly designed. The poly is dense and strong, they have clever plastic frame runners and they are easy to assemble. I’ve kept bees in them for a couple of seasons and they did fine. 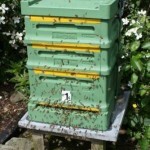 However – for me – the negatives of these hives far outweigh the positives. They have handles on all four faces of the boxes which, together with the manufacturers name, means painting them takes ages. Much more significantly, the boxes can only accommodate 10 frames and are too narrow. 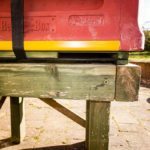 The frame lugs of a standard National frame are tight against the sidewalls making it almost impossible (once there’s a bit of propolis added to the mix) to slide the frames across the hive during inspections. The obvious solution was to flog the boxes to some unsuspecting novice. However, since the design problems would provide a particularly unrewarding start to beekeeping, I didn’t do this and they’ve sat piled in the corner looking a bit forlorn. The original floor, brood box and roof were pressed into service as a bait hive last year and worked well. The supers have simply been stacked up, unwanted and definitely unloved. However, the combination of a bulk delivery of extruded, twinwall, fluted polypropylene (aka Correx, though it certainly isn’t going by the price I paid) and the ease with which it could be converted into very useful roofs for about £1.50 each, suggested a way to use the supers. Two stacked supers – at least of these slightly smaller than normal “National” boxes – enclose a volume of about 43 litres. Conveniently this is only slightly larger than the 40 litres recommended by Tom Seeley in his excellent book Honeybee Democracy. 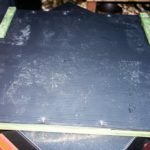 The addition of a simple floor from a piece of Correx (so much easier to write than extruded, twinwall, fluted polypropylene 😉 ) stapled together with some scraps of wood from the offcuts bin and including an integral entrance of about 10cm2, a crownboard from strong polythene sheet and a Correx roof make a perfectly serviceable bait hive for the coming season. In due course I’ll add a single tired old brood frame (I save these from the previous year, treated with DiPel [Bacillus thuringiensis sp. kurstaki spores] to prevent wax moth damage) containing no stores or pollen, which would simply attract robbers. 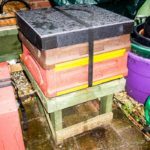 The smell of ‘old bees’, perhaps coupled with a couple of drops of lemongrass oil along the top bar, is a strong attractant to scout bees from a swarm looking for a new home. I’ll fill the boxes with foundationless frames so that an incoming swarm can start building new comb immediately. These frames barely reduce the internal volume but provide guides for the bees to build parallel comb, thereby making it unnecessary to check whether the bait hives have been successful quite as frequently as you otherwise need to (unless you like sorting out the wild comb they’ll otherwise build from the roof). Floor detail … what could be simpler? 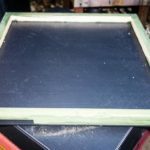 This entry was posted in Beekeeping, DIY, Hives and nucs, Swarms and tagged bait hive, Correx, DIY, foundationless, frames, poly, supers on April 10, 2015 by David. 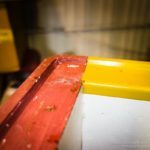 Reference your comment about the ‘unsuitable kit’ outlay on MB poly hives, I too may have made a mistake in starting with these. 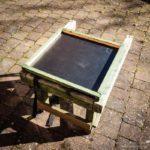 I live in Provence, so thought the extra insulation would help the bees in summer, and also with a suspect back, the lighter weight would also be a bonus, so I started with three Langstroth Jumbo plus supers. I now think that it may be advantageous to be able to mix and match with normal wood supers, and am interested in your views on dimensions for a suitable eke to make this workable for the bees. You may also be interested in my initial results with the Apishield trap in my battle against the dreaded Asian Hornet, which will no doubt be arriving in the UK before long. The answer is, unfortunately, that they do not seem to work at all! I have not trapped a single hornet in over 10 days use, although I have managed to “swat” about 20 hovering in front of my hives waiting to catch the bees in flight. The problem with mix’n’match of the MB poly and cedar hives is the bee space gets butchered. I use a thin shim … perhaps 35mm wide softwood, the ‘inner’ hole being the size of the inside of a cedar box. This therefore widens the top of the box, allowing the MB box above to sit neatly without any gaps. I’ve not used the MB poly Langstroth boxes but my understanding is that the width of the box for the short-lugged Langstroth frames isn’t an issue as it is with the National sized box. Remember that you can add cedar supers on top of an MB poly super and they fit OK. All may not be lost. 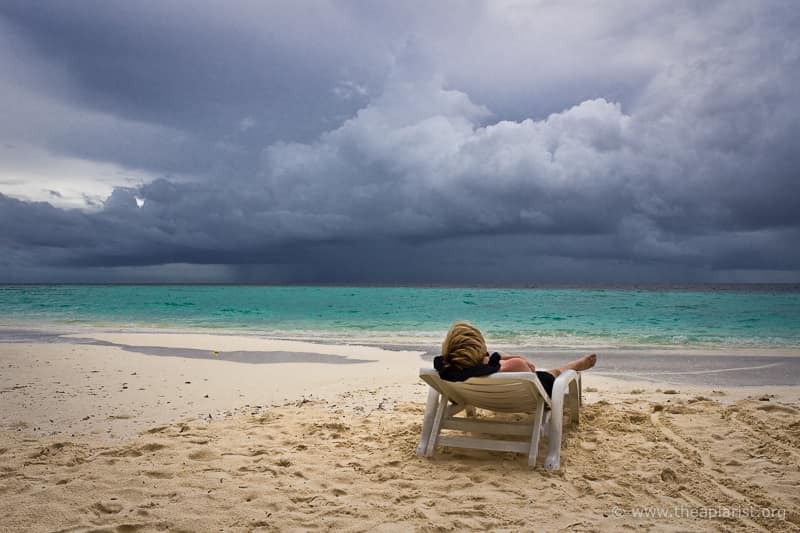 They’re certainly lighter and the insulation will help in your summers and our winters. Pity the Apishield trap doesn’t seem to work for you. I’ve only seen them in a video shown by Vita at a bee event. You should provide some feedback to Max Watkins at Vita.